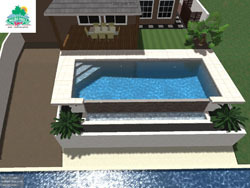 At Malibu, we use the latest 3D pool design software to create virtual swim through pool design presentations. 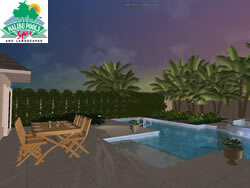 Our specialised pool design programs allow each site to be designed with all material and design options in 3D reality. In combination with the online Malibu Pool Design Design Studio, our clients can see the finished product before construction of their pool projects. The Malibu Design team can create your complete inground pool & landscaping package into a workable 3D model from the first design meeting. Step 1. Initial Brief: Once an onsite meeting has been made our sales consultants will meet with you which we ask you to outline the brief and the goals of your pool design and lifestyle desires. Step 2. Presentation: Our pool designers will return to you an itemised and priced proposal, with all options and specifications. Step 3. Contracts/ Scheduling: Once you have accepted your scope, the sales consultant will then go through all appropriate documentation to finalise your pool project contract process. To process to engineering, at this stage or shortly after a team member will contact to organise and secure your markout and dig dates. Step 4. Project Approval: On acceptance of the design and proposal the Malibu team will submit the designs and plans to our engineers and certifiers. We offer the complete package from design through development application and final certification of your in ground pool. Let us show you your vision in 3D today. 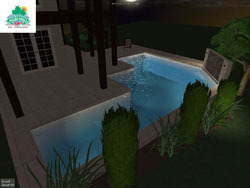 We create customised 3D concepts of your complete pool and landscape project with all finishes and materials included for swim through presentations. Our specialised team of landscape designers offer the latest in outdoor design for your home. Our detailed construction quotes offer an all inclusive up front package with itemised sections of costs and optional upgrades available for your consideration. Take the hassle and stress out of your project by working with an experienced name you can trust. We use the latest technology in fresh water pools and quality energy efficient hydraulic operating systems, which will reduce your chemical reliance and energy use to save you time and money. Let us create for you a pool that is always clean, fresh, safe and inviting without the ongoing cost of heavy chemicals and cleaning. We specialise in working with you to offer a complete design and construction experience from initial concept design through construction to final handover. We make the material selections for your new pool and landscaping easy, by bringing all the options to your home for your selection. Let our designers work with you to recommend and create an individual pool that is a reflection of both your lifestyle and your personality. Our pools are as unique as you are and we build for lasting quality not mass produced quantity. We build a limited number of projects to guarantee that each of our clients receive the attention, communication and professional project management we are known for. We want your positive referral and we guarantee to do everything we can to insure we get it. Our team of specialised builders work to the highest industry standards to create luxury pool projects built with both passion and professionalism. All our pools use the highest quality materials and interiors including natural stone, polished pebbles, quartz, glass beads and fully tiled. We guarantee each pool will be an eye-catching creation for your family and friends to enjoy day or night.